We’d love your help. Let us know what’s wrong with this preview of The Power of Love Activation Cards by James Van Praagh. Your goal while inhabiting human form is to manifest love in this physical dimension. Yet, like many a courageous soul who has chosen to tackle this difficult task, you may need to be reminded to activate this innate force that dwells inside you. This 44-card deck—a labor of love created by internationally renowned medium James Van Praagh—prompts you to remember that love Your goal while inhabiting human form is to manifest love in this physical dimension. Yet, like many a courageous soul who has chosen to tackle this difficult task, you may need to be reminded to activate this innate force that dwells inside you. This 44-card deck—a labor of love created by internationally renowned medium James Van Praagh—prompts you to remember that love is the reason why you are here. Just pull one card each morning for you to focus on that day, or follow the instructions in the companion guidebook and become adept at creating “Activation Spreads” for yourself, friends, or clients. 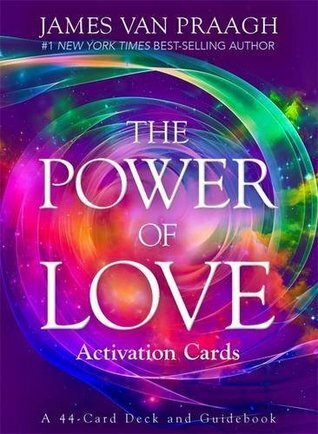 To ask other readers questions about The Power of Love Activation Cards, please sign up. His very natural, easy-going style would lead you to believe that James Van Praagh is chatting with a friend on the telephone, not communicating messages from the grave. James is a survival evidence medium, meaning that he is able to bridge the gap between two planes of existence, that of the living and that of the dead, by providing evidential proof of life after death via detailed messages. "I'm His very natural, easy-going style would lead you to believe that James Van Praagh is chatting with a friend on the telephone, not communicating messages from the grave. James is a survival evidence medium, meaning that he is able to bridge the gap between two planes of existence, that of the living and that of the dead, by providing evidential proof of life after death via detailed messages. "I'm clairsentient," he explains, "which simply means clear feeling. I feel the emotions and personalities of the deceased. I am also clairvoyant," he adds, clarifying that, "the first is feeling, the second is seeing, very much like Whoopi Goldberg in the movie, Ghost." The true essence of the messages are the feelings behind the words. James is an expert on this subject, since he has been in touch with those feelings most of his adult life. "The spirits communicate by their emotions. No words exist in the English language, or any other for that matter, which can describe the intense sensations."